Two out of three children born today in Frankfurt am Main, Germany, have an immigrant background. This clearly shows that the idea of integration has to be transferred as quickly as possible to the civil society in the host country. This example was presented by Walter Kindermann, Head of the Integration Department of the Ministry of Justice for Integration and Europe in Hessen, at the IRE conference “Integration policies at regional and local level” on 4th of December 2013 in the City Hall of Graz. In a panel discussion the commitment and best practice examples of the regions and communities in Austria, Germany and Switzerland were presented. A successful integration policy cannot be implemented without the commitment of the regional and local authorities. There are different approaches and activities, which are worth sharing. Although national governments can establish a framework, detailed concepts need to be developed by the municipalities itself. Migration should not be viewed as a problem but as an opportunity with potential, said Dr. Franz Schausberger, chairman of the Institute of the Regions of Europe (IRE) in his introduction to more than 90 participants. A ‘culture of welcome’ on the part of the population must be initiated, in order to counter the currently prevailing skepticism. Lelia Hunziker, Managing director of ‘Integration of Aargau’ in Switzerland, added: “There’s no panacea since it must be applied on the different and individual needs of communities. Every community has a different composition of ethnicities, cultures and religions.” Dr. Andreas Kiefer, Secretary General of the Congress of Local and Regional Authorities of the Council of Europe, emphasizes the importance of economic independence of immigrants, which results in good integration. Not only regulations are to be applied in order to improve the process of immigration. A bottom-up approach should be encouraged, so that objective information will be communicated to the people. An active handling of the topic by involving the civil society, which is the idea of Dirk Fassbender, deputy head of the European Commission Representation in Vienna. Furthermore, Fassbender reported on the EU Integration Fund for the new funding period, which is currently being negotiated by the European Parliament and the EU Council of Ministers. An innovation of the Commission was introduced: for the very first time the fund is designed for regional not national structures. Kindermann adds a top – down approach. Integration must be declared priority by the mayor, so that a discourse process is guided on two levels, which will result in a successful implementation of integration measures. Filip Radunovic, a native Montenegrin, who studied in Vienna, is project manager of the ERSTE Foundation in the program area EUROPE. He explained: „Austria should be proud to be a country of immigration in Europe. We will remain behind globally, if we do not finally understand that only through successful integration a new door opens to a common world. Our future depends on migration in an economic, demographic, cultural – and therefore also political – way “. The Councilor for Integration of the City of Graz Detlev Eisel – Eiselsberg says that a good education is an essential factor for good integration. Graz has a special role in this regard, as it introduced a migrant advisory board as the first city in Austria. The aim of the conference is to work out a declaration of Graz in regard of immigration. 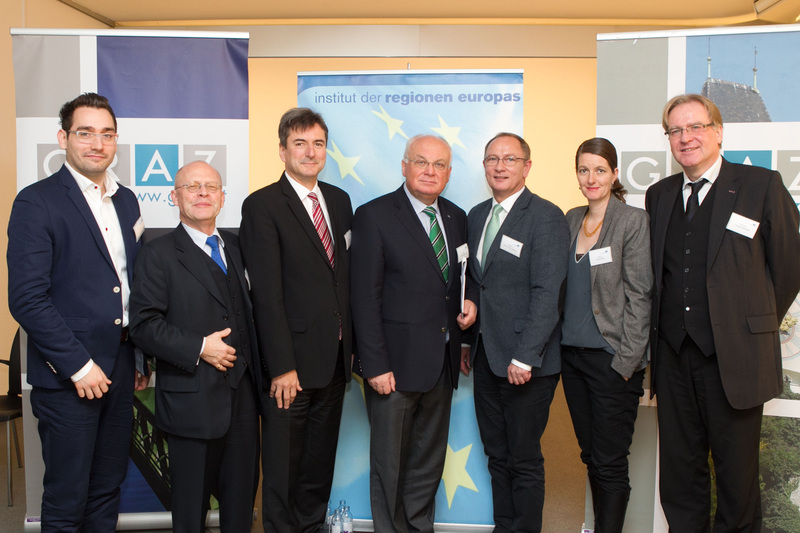 The event was organized by the IRE, in cooperation with the Austrian State Secretariat for Integration, the city of Graz and the Congress of Local and Regional Authorities of the Council of Europe on the occasion of the Austrian Presidency. The IRE event was the first conference under the Austrian Presidency, which addressed the issue of integration in a local and regional dimension. Numerous experts from European institutions, governments, agencies, institutions and NGOs participated in this conference.